WILMINGTON, Del. – Governor John Carney announced on Tuesday that Delaware schools can now apply for $1 million in special funding to improve supports for low-income students, students chronically exposed to stress and trauma, and English language learners. The new Opportunity Grant program – created and funded by Governor Carney and members of the General Assembly in the Fiscal Year 2018 budget – will help Delaware identify and incentivize schools with proven strategies for helping disadvantaged students succeed in the classroom. Through September 5, school districts and charter schools can apply for up to 10 competitive Opportunity Grants through the Delaware Department of Education. Schools may receive a maximum of $350,000 in funding to support programs in the 2017-2018 school year. Governor Carney pledged last week that he would take decisive action over the next year to address Delaware’s achievement gap, and he has made it a priority to support disadvantaged students in Wilmington and across the state. Earlier this month, the Governor announced that Dorrell Green, a longtime Wilmington educator, would lead a new Wilmington-based office to support teachers and students in Wilmington’s neediest schools, and in schools serving at-risk students statewide. 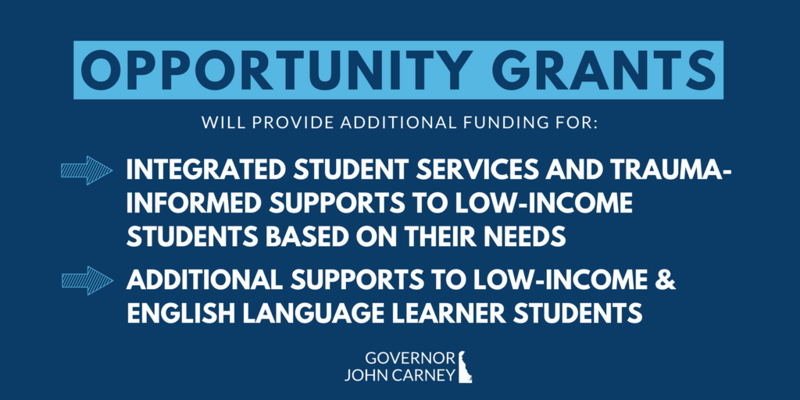 Additional supports to low-income and English language learner students. In considering applications for funding, the Department of Education will give preference to school-level initiatives, rather than broader district or organizational programs. Grant applicants must outline a detailed plan for how funds will be used – and grant recipients will be required to provide information on the outcome of the support, in an effort to showcase what is working. Grant awards will be announced in September. Superintendents will meet next week with Secretary Bunting, and will have the opportunity to ask questions and discuss the grant process.